I am proud to be in Safety Patrol because I get to help people when they get hurt. I really like it because I feel good about myself knowing I have kept someone safe. That's what Safety Patrol is all about. I like doing it because the older kids kept me safe and now it is my turn to keep the little kids safe. That's what being a role model means. Helping your fellow students or friends and keeping yourself safe. 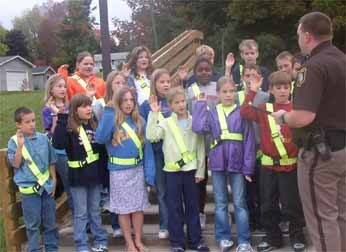 I am proud to be a Safety Patroller. I think that working for the common good is great. What we do for the common good is we all have our positions for just a week. So some of us have to be off. Safety Patrol is a lot of fun. I started last year. I love working for the common good. Mrs. Milarch directs the Safety Patrollers. They meet each Monday to discuss the past week and get their assignments for the week ahead. Safety Patrolling is lots of fun. My favorite position is "front". That is when you go at the end of the sidewalk (where the buses leave). 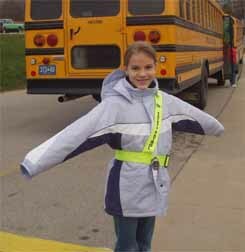 The main job of a Safety Patrol is to keep people out of the road while the buses are moving. Safety Patrolling is lots of fun. Safety Patrol Members were sworn in October 13th by Deputy Torrey of the Sheriff's Department. I like being on Safety Patrol because in the afternoon you get to leave class early. It is also fun to watch the buses go by. I have to make sure kids don't get run over. When the buses leave you can go inside. That is what I like about safety patrol. 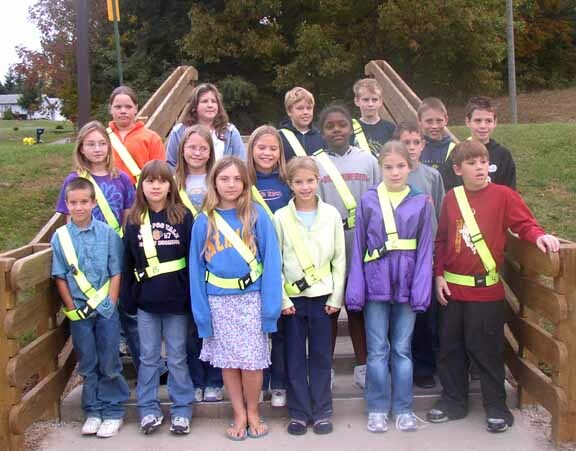 I am the fifth grade line person in Safety Patrol. I have to keep the fifth grade line straight. Also I have to make sure that no one goes in front of the buses while they're moving. I also have to make sure no one runs on the sidewalk. During the week a kid was running and tripped. He got a cut so I took him to the office to get a band aid. I've also been cross walk. We have to put our hands out when a bus comes to stop people from walking in front of buses. Once a kid was running down the steps. Before we could put our arms out he was half way across so I told him to run the rest of the way. Safety Patrol is boring (but fun sometimes). I go in mornings. This week I was on. Next week I will be off. It is very cold. I'm crosswalk. I have been crosswalk every other week. We have a lot of different spots. You can be inside door, or you can be 5th grade line. You can also be top. Or you can be crosswalk. Inside and outside door is where you stand and hold the doors for little kids. 5th grade is where you stand at the front of the line and make sure that they are behaving. Cross walk and top is where you stand on the stairs and make sure the little kids do not run in front of the buses. 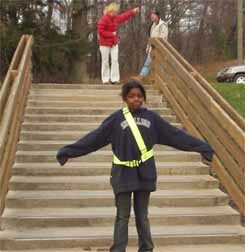 I am in Safety Patrol. I haven't had the chance to be captain yet, but I will. My position is crosswalk. My favorite is inside door. When you are doing crosswalk you have to put your arms out so the people won't get hit by a bus. Safety Patrol is really fun. If you are inside door you hold the door for the little kids. 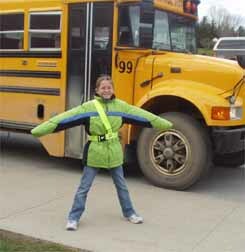 I love Safety Patrol. I am proud to be in Safety Patrol. Sometimes it is fun, but when it gets serious it is not. Like when someone gets hurt that is not fun. I think everyone who signed up for Safety Patrol is proud to help. I know I am. 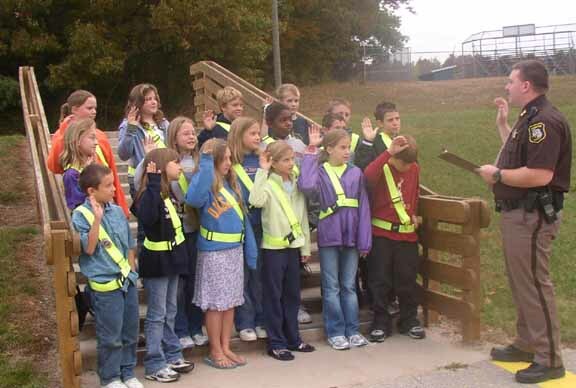 I am proud to be a Safety Patroller. I get to make sure everybody and everything is safe and clean. Being on Safety Patrol is important because you have to watch people all the time to make sure they're not running or going in front of buses while they are moving. 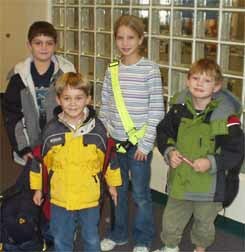 I like Safety Patrol because I am working for the common good.